Nerf War Parties v Combat City in Glasgow and Dundee. Give the popularity of Nerf Guns TM at the moment some customers have asked us about running Nerf War Parties at our two Combat Laser Tag Arenas . We have researched the Nerf Guns, and whilst they are fun for a few friends to play at home, they are pretty limited when it comes to parties for 10 to 30 players. 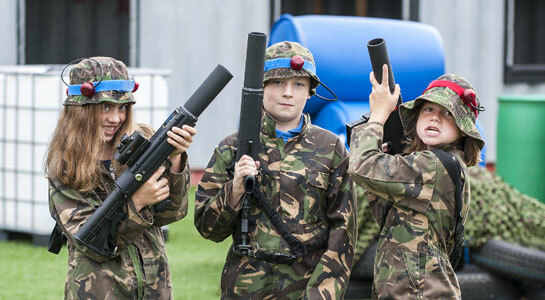 In comparison Combat Laser Tag offers the following in comparison to Nerf War Parties. When it comes to booking a memorable and exciting party we feel that laser tag wins every time, so we are investing in offering the best laser tag birthday parties possible rather than offering what we feel is an inferior experience with foam darts. With several years experience of running Birthday Parties in Glasgow and now Dundee we aim to take all the hassle out of running a party so that you can just turn up at the arena, and enjoy the kids having a great time. Combat Laser Tag gets them off the screens, and moving around for an hour or so of intense gameplay, where communication, planning and team work are essential for victory. Please come down and visit the centres to see what we have to offer.